Here's a link to the post, it may expire or be archived some day soon and be rendered useless so I also printed it to PDF here. 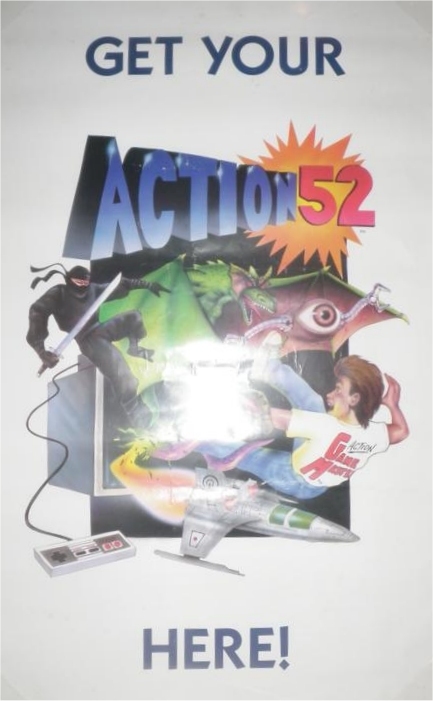 A very fine example of a complete Action 52 for NES set. 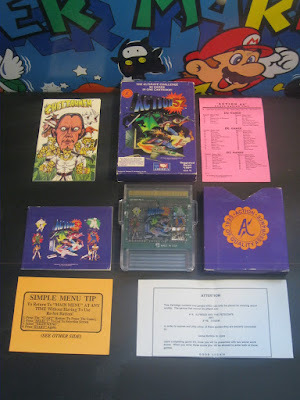 Except for the missing styrofoam piece that stops the cart\sleeve from moving around inside the box. Item condition was listed as "Good". It included the box, sleeve, cart, comic book, instruction manual, game list sheet, "Simple Menu Tip" sheet, and another sheet about Alfredo, Jigsaw, and Ooze, explaining they could only be played by entering "Secret worlds". Although the item was listed as a "Sega Genesis" under the detailed item description, it's obviously an NES version, just the run of the mill clear production version, not even the rarer black PCB version. They also mistakenly posted a screenshot of the Genesis title page. No biggie. Item was guaranteed to work 100%. Looks like the seller "cokekid7" is an avid collector of not only soda products (hence the name) but of vintage toys, games, etc. As of today he has 116 vintage, retro, etc. toys, items, games, etc. posted on eBay for sale including G.I. Joe, A-Team, Transformers, all old school stuff. I think this is great for the vintage gaming community. The fact that such an item would sell for close to US$600 is a testament to the strength and value of vintage gaming memorabilia. Congratulations to the seller, AND bidder ! I've enabled comments to this post and depending on the response may continue to do so for any future posts so feel free to chime in !